You need to be on a laptop or desktop computer in Chrome to see it. When you click on it a contact chat window will open and you can contact us. 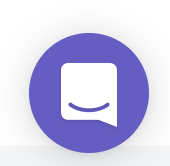 If the icon doesn't get shown, please check your browser privacy settings - if you have any extensions installed such as Ghostery or Adblock, make sure to whitelist help.clipchamp.com and reload the page afterwards. Note that at certain times of the day or on weekends it can take some time to receive a response due to time zone differences and our office hours.